The title of this book is a mouthful for such a slim volume. But the message is huge. Anyone concerned about the state of our world, or, especially anyone who isn’t, should read this book. It won’t take long. Here, our future historian, living in the Second People’s Republic of China, recounts the events of the Period of the Penumbra (1988-2093) that led to the Great Collapse and Mass Migration (2073-2093). … the most startling aspect to this story is just how much these people knew, and how unable they were to act upon what they knew. Knowledge did not translate into power. At the very time that the urgent need for an energy transition became palpable, world production of greenhouse gasses increased. This fact is so hard to understand that it calls for a closer look at what we know about this crucial juncture. Western scientists built an intellectual culture based on the premise that it was worse to fool oneself into believing in something that did not exist than not to believe in something that did. 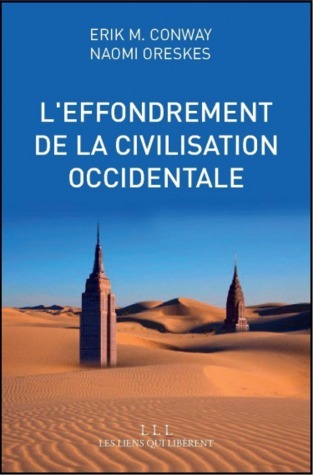 The thesis of this analysis is that Western Civilization became trapped in the grip of two inhibiting ideologies: positivism and market fundamentalism. A key attribute of the period is that power did not reside in the hands of those who understood the climate system, but rather in political, economic and technological policies that drove the continued use of fossil fuels. These quotes offer short snippets of the topics covered in the book. 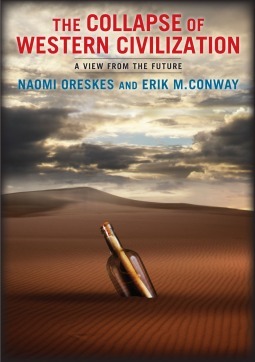 The authors go on to explain each conundrum and how it had a hand in the Great Collapse. It was both interesting and terrifying to read about the results of sea levels rising, temperatures increasing, prolonged crop failures, expanding deserts, mass extinction and migration, capitalism, governments panicking and breaking down. Possibly more terrifying than a horror novel due to the fact that we are on this course as we speak. Quite frankly, this book makes us look ridiculous. Because it really is ridiculous that we know what’s going on but we are still carrying on as usual. And yet this book offers us hope for the future; the book is written by someone in the future, after all. And their incredulity of our actions hints at a better way of life. I have Valorie to thank for recommending this book to me. You can find her thoughtful review and how the book came to be written here. Valorie also offers a more hopeful book, as an antidote to the doom and gloom of this one. Here’s another one I think looks nice. Has anyone read it? I skimmed the Boyd book. 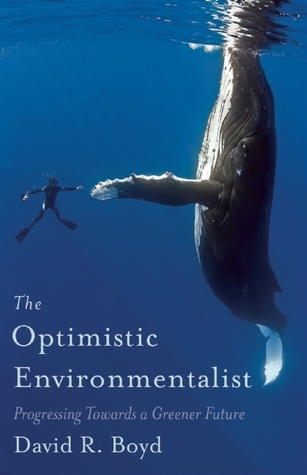 He chooses to celebrate success stories – bringing bald eagles and gray whales back from the brink of extinction; harnessing wind and solar power; clean air acts and the restoration of the ozone layer – and believes that humanity will continue along those same beneficial, enlightened paths. (And he’s an environmental lawyer so should know his stuff.) It seemed to me like a good tonic to some of the more depressing accounts out there, e.g. The Sixth Extinction by Elizabeth Kolbert. So this was a novella? Did it have a plot, or was it all polemic? It sounds like one of those that might sacrifice story for agenda. It’s written as though it is a government report in future China. It certainly does have an agenda. The authors are unapologetic about that it was their intention. Naomi, sorry to jump ahead of you in responding to the comment, I get carried away! It was a novella, but it read like non-fiction, which I thought was kind of different. It was a report written by an historian from the future about events that happened in the past. It’s not telling a story, but reporting on events and theorizing about why and how these events came about. Does that clear it up a bit? Does Boyd say he believes that these positive developments will eventually overcome the negative ones? It’s nice to have the books that keep us hoping, though, isn’t it? Maybe it’s better to inspire people than to put the fear into them. Thanks for your explanations. I didn’t mean for it to sound like I was dismissing the book. It clearly was powerful and valuable for both of you. I just wondered how it would read as a novel. It’s very interesting that they chose the medium of fiction. As to the Boyd book, he’s mainly presenting positive situations as a counterpoint to doom and gloom scenarios. He seems quite optimistic about human ability and motivation overall (as the title suggests! ), but I can’t be quite as hopeful as he is when the political will isn’t there to keep moving towards these kinds of changes. And, no worries – it’s a different format (The Collapse of WC). I probably have never read a book like it before now. I think it works well for what it’s about, though. Naomi I’m so glad you read this book. I found it chilling and mesmerizing. I didn’t know about Boyd’s book, I’ll have to check it out. Thanks for writing about it, and bringing it to my attention! Hmmm, doesn’t really sound like my cup of tea. It’s true that it’s kind of scary. And, it felt pretty real – I started to panic for the kids. Thinking about the kids is the scariest part. “Knowledge did not translate into power.” What a profound sentence that is! Thank you for writing about this important book, Naomi. I surely look forward to reading both the books. Thanks for reading, Deepika! The book gave me a lot to think about. And, the other one looks good, doesn’t it? Even the cover gives me the warm fuzzies. This premise sounds fascinating and right up my alley. You say it’s a novella? How long is it? I may be able to fit it in for a quick read one of these weekends. I have already sent it back to the library, but I think it was less than 100 pages (Goodreads says 89). You can definitely squeeze it in between a couple of longer books! I like the concept of the book, but I think I’d have to approach it as polemic because I’d rather read straight-up speculative fiction (with a plot and character development) if I’m going to read depressing near-future stories . . . I would agree with you if it was long. But it’s sort of like reading a really long article. I was surprise by how it sucked me in. This sounds like a very interesting read and I like that it highlights how silly it is for us to be doing nothing about potential disasters we see coming. It does sound pretty scary too! It think you might like this one. Fiction that reads like nonfiction, which is something I normally wouldn’t find appealing, but in this case it works well. I think so, too. But, I often wonder how many of the people who *should* be reading these books are actually the ones reading them?